Manatees are large marine mammals that inhabit shallow rivers, canals, saltwater bays, and coastal areas. A migratory species, they spend their winters in the Florida waters and move as far north as Massachusetts and as far west as Texas during the summers. Manatees must surface to breathe air. They are known to rise out of the sea like the alluring sirens of Greek mythology and often perform “tail stands” in shallow water. From a distance, they could be mistaken for humans. Their forelimbs contain five sets of finger-like bones, and their neck vertebrae allows them to turn their heads. Manatees have a higher gray matter to white matter ratio in their brains than any other mammal known, including humans. Primarily herbivores, manatees can consume fifteen to twenty percent of their body weight in vegetation daily. While manatees can travel up to 20 miles per hour in short bursts, they usually travel three to five miles per hour. Along the coast, they travel in water that is 10 to 16 feet deep and they are rarely seen in areas over 20 feet deep. Manatees are not sexually mature until they are about five years old. During breeding, a single female (cow) will be followed by a dozen or more males (bulls), forming a “mating herd.” The gestation period is about a year and mothers nurse their young for one to two years. They have a lifespan of about 60 years with no known natural enemies. A certain percentage of manatee mortality can be attributed to natural causes such as cold stress, gastrointestinal disease, pneumonia, and other diseases. In the past, manatees were exploited for their meat, fat, and hides. But the most significant challenge faced today is the loss of habitat. Increased coastal development and poaching have significantly reduced the size of the manatee population. Experts believe that pollution in these areas may also have an effect on manatee mortality, as chemicals introduced into their habitats can lead to impaired immune systems. A high number of manatee deaths result from collisions with boats when the mammals are surfacing for air. They are not fast enough to elude the boat propellers and suffer from fatal gashes. Other accidents include entanglement in crab trap lines and ingestion of fish hooks and litter. 1893 – Florida is declared a manatee sanctuary and manatee hunting is illegal. 1907 – Law is revised to impose a fine of $500 and/or six months of jail time for molesting or killing a manatee. 1966 – The manatee became one of 78 original species listed in the Endangered Species Preservation Act. 1972 – The manatee was designated a marine mammal protected under the Federal Marine Mammal Protection Act. This act prevented the removal of any marine mammal and imposed a fine of up to $2000 and/or one year in jail. 1973 – The Endangered Species Preservation Act was revised to increase federal protection of manatees. 1976 – Sea World of Florida began a Manatee Rescue and Rehabilitation Program. 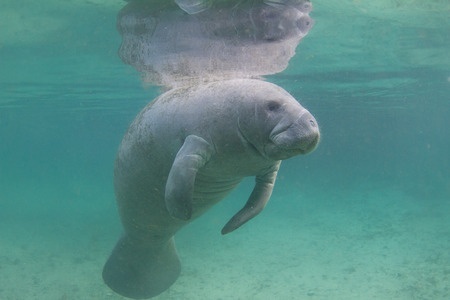 1978 – The Florida Manatee Sanctuary Act amended the 1907 state law. Florida became an official refuge and sanctuary for the marine mammals. The regulation of boat speeds in areas of manatee inhabitation was now allowed. 1979 – Florida Governor Bob Graham established the first state-designated protection zones and made November Manatee Awareness Month. 1980 – Congress allocated $100,000 to the Marine Mammal Commission and the development of the initial Federal Manatee Recovery Plan. 1981 – Bob Graham and Jimmy Buffett formed the Save the Mantee Committee, the precursor of the Save the Manatee Club, which sought to protect manatees and their habitats. 1996 – The U.S. Fish and Wildlife Service revised the Manatee Recovery Plan Objectives to include the following: assess and minimize causes of manatee mortality and injury, protect essential habitat, determine and monitor the status of the manatee population, coordinate and oversee cooperative recovery work. Learn more about the Save the Manatee Club’s mission here. This entry was posted in Mermaids, Mondays for Mermaids and tagged Joanne Guidoccio. Bookmark the permalink. I hope to see them up close and personal some day. Are they friendly? I love manatees! They are adorable. I’ve never seen them in the wild but it is on my bucket list.